An intimate one bedroom property that is ideal for couples, its interiors are modern and bright with some tasteful traditional touches. The accommodation is all situated on one floor and has been designed with modern furnishings to complement the bright décor. A small, comfortable lounge with a sofa, that doubles as a bed, adjoins the dining area, and there is a compact kitchenette, well-equipped with a range of modern amenities. Glass doors lead from the lounge to the shaded and furnished poolside decking and to the pool, which is set to the front of the villa,furnished with comfortable loungers - perfect to unwind on and top up your tan. The accommodation is completed by a shower room and a twin bedroom with 2 double beds and glass doors that also lead out to the poolside terrace. We've spent one fantastic week at the villa. 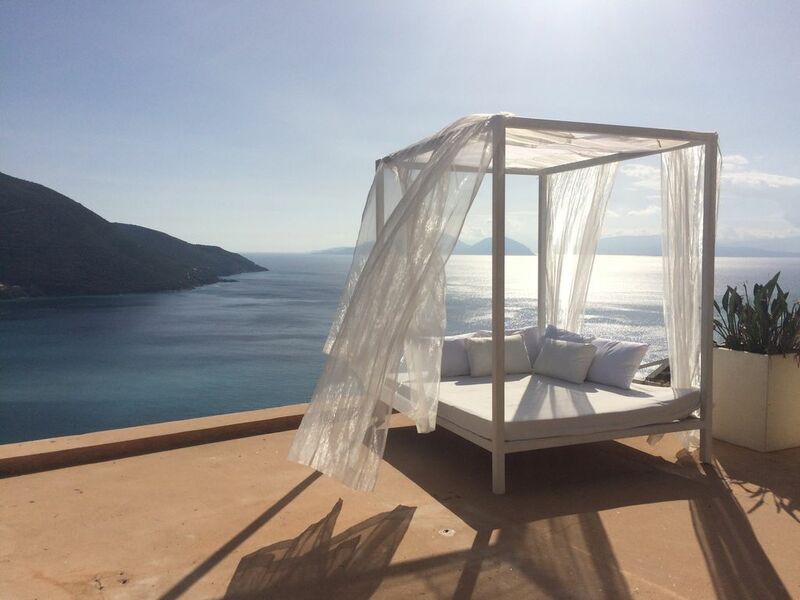 Everything is like in the pictures – beautiful private villa, stunning view, infinity pool. George, the property manager, is very friendly and kind. The villa is part of a group of 6-7 similar villas – some bigger, some smaller, but what was great is that they're positioned in such a way that you have privacy – it's great for couples! Waking up every morning and seeing the sun rise over the Vassiliki bay was absolutely amazing! Babies 0-3 free of charge. Extra persons will be charged 15-30 euros ( depending from the season )...The customers have 2 days time to deposit 30% in our bank account.If not we have the right to give the villa to another costumer. Rate is for 4 persons including maid service, electricity, water and taxes. We provide all linen except towels for the beach and we change it every three days. Babies 0-3 free of charge. Extra persons will be charged 15-30 euros ( depending from the season )...The customers have 2 days time to deposit 30% in our bank account.If not we have the right to give the villa to another costumer. ______________________________________________________________________________________ Booking Acceptance: Please be informed that we are not accepting bookings within Mondays to Fridays. We are accepting bookings either Saturdays to Saturdays or Sundays to Sundays.